1. In vivo effectiveness of a starch absorption blocker in a double-blind placebo-controlled study with normal subjects. 2. In vivo effectiveness of a starch absorption blocker in a double-blind placebo-controlled study with normal college-age subjects. 3. Phase 2� Demonstrates Efficacy When Taken With a Mixed Full Meal. 4. Starch Neutralizer Promotes Weight Loss, Lowers Triglyceride Levels. 5 Investigation of the efficacy of Phase 2�. 6 Summary of clinical study evaluating effectiveness of Phase 2�. 7 Chronic Toxicity Study Confirms Safety of Phase 2�. In vivo effectiveness of a starch absorption blocker in a double-blind placebo-controlled study with normal subjects. Analysis data were obtained from the first study done reported on September 6, 2001 and the second study on November, 20, 2001. The total subjects from both studies numbered 20. Nine were excluded who did not furnish all blood samples or who had a negative area for the plasma glucose-time curve and were therefore poor absorbers. Of the 11 subjects, 8 were female and 3 were male, ranging in age from 21 to 57. The Phase 2� group had significantly lower plasma glucose at 60 minutes and almost significantly lower glucose at 45 minutes. The area of the curve (area above the baseline which is 0 to 62 minutes for Phase 2� and 0 to 80 minutes for the control), which represents glucose absorption and metabolism, was 66% smaller with Phase 2� . This product shows effectiveness in both sedentary college-age subjects and physically active adults. November 20 - In vivo effectiveness of a starch absorption blocker in a double-blind placebo-controlled study with normal college-age subjects. Inhibition of carbohydrate metabolism or absorption is one mechanism to reduce hyperglycemia in normal and especially in diabetic subjects. Another possible benefit is the decrease in calorie intake after eating carbohydrates for obesity and weight loss. In the 1980's there were several reports of in vitro and in vivo effectiveness of a natural starch blocker that worked by inactivating the enzyme amylase. We investigated this hypothesis with an initial pilot study. After this initial study with subjects who were physically active during the study, we did a second study to confirm the results. In this second study, again there was a double-blind placebo-controlled crossover trial with ten subjects (five males and five females aged 21 to 27) who participated with informed consent. After an overnight fast the subjects appeared in the morning and were given in a random fashion either 1) placebo consisting of 4 slices of white bread (60 g of carbohydrate), 42 g of soybean oil margarine, and 4 g of Sweet N'Low; 2) experimental comprising the control plus 1.5 g of Phase 2� (Pharmachem Laboratories). The subjects rested between blood drawings. Plasma glucose was measured from blood sample drawn at baseline and every 15 minutes for 1 hour, then every 20 minutes for the second hour. Two subjects did not complete the study and 4 subjects were poor/non-absorbers as the area under the glucose-time curve was negative. Therefore the data of the remaining 4 subjects was used. As expected the control bread produced an increase in glucose in the normal subjects that reached a broad peak after 45 minutes. The peak glucose for the Phase 2� group occurred at 30 minutes. This dose of Phase 2� produced a smaller increase than the control from 15 to 80 minutes, with an almost significant difference (p < 0.1) at 45 and 60 minutes. The glucose cleared from the plasma about 30 minutes earlier with the Phaseolamin™ compared to the control. The area under the plasma glucose-time curve (a measure of glucose absorption and metabolism) was 85% lower with the Phase 2� , p < 0.05. Thus only 15% of the glucose in the bread compared to the control found its way into the body in the presence of Phase 2� . These results show the effectiveness of the product in decreasing the absorption of glucose from complex carbohydrates from this group of subjects. University of Scranton researcher, Prof. Joe A. Vinson, reports that Phase 2� reduced starch absorption by 28% when 0.75 grams of the ingredient was mixed with a full meal and served to participants in a random, blinded fashion. Three previous human pilot trials conducted by Vinson confirmed that 1.5 grams of Phase 2� were effective in reducing starch calories (an average of 66%) when study participants were fed a high carbohydrate, high fat meal of bread and margarine. "This study is important because it shows that half the amount of Phase 2� can be effective in a full meal containing carbohydrates, proteins and fat," said Vinson. "It is also consistent with previous studies. An even more significant difference in starch absorption may occur if respondents are given a higher dose of Phase 2� ." The study involved seven participants who consumed a microwaved control meal consisting of Hungry-Man Frozen Country Fried Beef Steak, along with 240 ml of water. The meal contained 630 calories with 64 grams of carbohydrates, 29 grams of protein, and 29 grams of fat in the form of breaded sirloin beef patties, mashed potatoes with gravy, mushrooms, green beans, and cherry-apple crumb cake. The control group received only the meal, while the other group received the meal with 0.75 grams of Phase 2� mixed in with the mashed potatoes. KEARNY, NJ, DEC. 10, 2002—Patients who took a concentrated starch neutralizer extracted from the white kidney bean, lost nearly a half pound per week (3.8 lbs. over eight weeks), on average, or better than 200% more than those on placebo. Patients on the starch neutralizer also lost 1.5 inches around their waists, on average, or 43% more than those on placebo. “The results are encouraging, and look very promising,” said chief researcher, Jay Udani, M.D., Medical Director, Integrative Medicine Program, Northridge Hospital Medical Center, Los Angeles, CA. “One of the most surprising results of the study was the impact that the starch neutralizer had on triglycerides, a form of bad cholesterol,” said Udani. “There was a dramatic, 26-point drop in triglyceride levels, on average, for patients taking the starch neutralizer, while those on placebo averaged only an 8 point drop in triglyceride levels. The difference between the two groups was more than 300%. Another surprising result, according to Udani, was the effect of the starch neutralizer on energy levels. No significant adverse effects from the starch neutralizer were reported by any of the patients participating in the study. Pharmachem laboratories, Kearny, NJ, is the supplier of Phase 2� starch neutralizer. The company develops, supplies and manufactures a variety of high-quality, efficacious food supplements standardized for specific potency, solubility, direct compression and disintegration characteristics. The Company operates four processing and manufacturing facilities in Northern New Jersey, including the H. Reisman Corporation. Pharmachem also owns American Ingredients, Anaheim, CA. Amylase is a digestive tract enzyme, which breaks down starch into small units capable of being further degraded to glucose, which is used for fuel for normal metabolism and body homeostasis. Clinical use of inhibitors of amylase activity has widespread appeal because a controlled reduction of starch digestion could influence carbohydrate uptake in diabetes and obesity, the latter of which is a current problem with 20% of the US population. Of course obesity is also linked to a greater risk of diabetes. A search in the National Library of Medicine Database reveals that there are 1098 articles concerning amylase inhibition. About 15 years ago there were a number of articles concerning the use of commercial bean-derived extracts. Also there were several articles indicating that some of these products, which were good in vitro inhibitors, were not effective when given to humans. Possible reasons for this failure were 1) insufficient activity; 2) destruction in the gastrointestinal tract; 3) suboptimal pH conditions; and 3) different gastric emptying rates of starch and inhibitor. A comprehensive experimental investigation by a group at the Mayo Clinic in 1985 found that the major reason commercial bean amylase inhibitors have failed to influence starch digestion in humans is their low antiamylase activity. Some inhibitors also have side effects such as diarrhea and an increase in intestinal gas. We have investigated the effectiveness of a new commercial bean extract (Phase 2� ) prepared by Pharmachem Laboratories using normal human subjects. Five males and five females (ages 21 to 57) participated in a double-blind placebo controlled crossover study with informed consent. All subjects were employees at a commercial clinical laboratory and went about their duties as secretaries and technicians during the study. After an overnight fast, the participants were sampled for blood and then given in a random manner either 1) placebo consisting of 4 slices of white bread (60 grams of carbohydrate), 42 grams of soybean oil margarine and 4 grams of Sweet N'Low spread on the bread; 2) experimental comprising the placebo plus 1.5 grams of Phase 2� prepared by Pharmachem Laboratories. Plasma glucose wasmeasured, by a commercial enzyme kit (Sigma Chemical Company), from blood drawn at baseline every 30 minutes for 4 hours. After 1 week the regimen was repeated with the other supplement. The subjects were normoglycemic as measured by fasting glucose concentration, which averaged 98 mg/dl for the placebo and 104 for the Phase 2� . 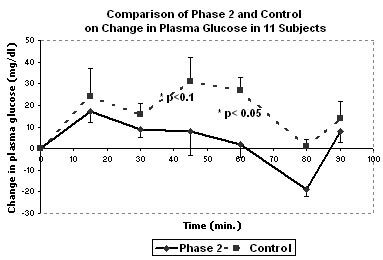 From 60 to 120 minutes (as seen in the accompanying figure) the change in plasma glucose of the Phaseolamin™ group from the baseline was � to 1/3 of the level of the placebo group. Phaseolamin™ consumption caused the plasma glucose to return to baseline values 20 minutes earlier than the placebo without Phaseolamin™. The average area under the plasma glucose-time curve from 0 to 150 minutes, which is a measure of absorption and metabolism, was 57% lower with Phaseolamin™. Plotting the average change in glucose concentration from 30 minutes to 210 minutes, the area under the curve was positive for the placebo but negative for Phase 2� . This indicates that very little of the glucose from the starch in the bread was absorbed when co-ingested with Phase 2� and the glucose was cleared very rapidly. No side effects were observed with this product. The promising positive preliminary results of this single dose pilot study need to be confirmed. More control of physical activity is required to decrease the variability of plasma glucose between subjects. Ingestion of Phase 2� with a conventional meal should be examined. Other groups such as diabetic and obese should be studied with a single dose and also in a long-term supplementation study. Summary of clinical study evaluating effectiveness of Phase 2� . Managing Director of Pharmeceutical Development and Service srl. A study on 60 human healthy volunteers, males and females, aged 20-45 years, which had been characterized by a 5 - 15 kg. overweight for at least 6 months was conducted to evaluate safety and efficacy of a food supplement intended to help weight loss by reducing absorption of calories from carbohydrates, comparing such a product vs. a placebo. The study was performed upon request from Consorzio RTC - Ricorche e Tecnologie Cosmetologiche. The considered products were identified as Blockal batch D106B and Blockal batch 1600301. An envelope containing qualitative and quantitative formulations of the samples and the key for the identification of the products was given to the Study Responsible and, if necessary was available for the researchers during all the study. At the end of the study the envelope was opened, and products and formulations identified in front of the Study Responsible and of a RTC delegate. To highlight the activity claimed by the considered product, volunteers were asked to take a tablet before a meal rich of complex carbohydrates. In this sense, 30 days before starting the test (t-30) each subject was controlled by a Dietician, that gave him/her a table with nutritional suggestions, recommending the daily assumption of complex carbohydrates during one of principal meals, so that they could get used to this regimen. All volunteers undertook to take the Dietician's advice and their weight was registered after 10, 20 and 30 days. Only 60 volunteers whose weight remained stable in such a period were recruited for the study. A 30-day double blind test for home use of the food supplement, with LAB control, was then performed. Volunteers undertook to maintain their regular habits (such as sport, or any other habits that could affect the study) and to follow the Dietician's nutritional advises. At the beginning (t0) and at the end of the study (t30), weight of each subject was measured. Fat body mass and lean body mass were calculated (bioelectric impedance measure method). At the same time (t0 and t30) a cutaneous echographia was performed on each subject to determine adipose membrane thickness. Such an evaluation was performed at trochanter zone in women and at abdominal zone in men. Waistline, hips circumference and thigh circumferences were also measured. Furthermore, at the end of the study, volunteers' opinions concerning tolerability and efficacy of the products were considered. At the end of the study (t30) results highlighted that the product determined a weight loss of kg 2,933 (corresponding to 3.90% of total body weight). Such a weight loss also determined a 10.45% reduction of fat body mass, without significant modifications of lean body mass. Results also highlighted that the product determined a 11.63% reduction of adipose membrane (by echography), a 3.44% reduction of waistline, a 1.39% reduction of hips circumference and a 1.44% reduction of thigh circumference. Personal evaluation also highlighted a good tolerability and a good efficacy of the considered product. At the end of the study (t30) results highlighted that the product determined a weight loss of kg 0.348 (corresponding to 0.47% of total body weight) without significant modifications of fat body mass and of lean body mass. Results also highlighted that the product determined a 1.30% reduction of adipose membrane (by echography), a 0.53% reduction of waistline, a 0.10% reduction of hips circumference and a 0.39% reduction of thigh circumference. Personal evaluation also highlighted a good tolerability and a low efficacy of the considered product. Results suggest that Blockal batch 1600031 (placebo) did not determine significant modifications of the considered parameters, while Blockal batch D106B demonstrated a good efficacy in reduction of calories intake form complex carbohydrates for an easier, correct and balanced weight loss (calculated by impedance measure), with reduction of adipose membrane thickness (echography) and a reduction of waistline, hips circumference and thigh circumference. Such results have to be correlated with the specific composition of the product that contains a vegetal glycoprotein capable of inhibiting pancreatic a-amylase. Such a protein (weight 49,000 Daltons) demonstrated in vitro an inhibition corresponding to 14.638 units per gram). It should also be stressed that in this study, food supplement was administered in correspondence of a complex carbohydrate high content meal, and that complex carbohydrates can be absorbed only after enzymatic parting trough pancreatic amylases. Weight loss, particularly of fat body mass, can be reconducted to a lower absorption of complex carbohydrates, due to the activity of the vegetal glycorprotein included in the food supplement taken before the meal. The study demonstrated the real capability of the considered product to determine in vitro weight loss trough fat body mass reduction via a reduced absorption of complex carbohydrates, that represent a relevant, or even excessive, part of calories intake. KEARNY, NJ, NOV. 5, 2002--Pharmachem Laboratories, Inc., today announced that a Chronic Toxicity Study (L.D.50) demonstrated that Phase 2 Starch Neutralizer™, the first standardized white bean extract used in a variety of weight loss supplements, is safe and non-toxic. • There was no significant weight changes in any of the animals. • Food consumption in the Phase 2� groups (1 gm and 5 gm) was found to be decreased significantly, especially after two months of treatment, compared to controls. • Liver function tests indicated that chronic administration of Phase 2� at the doses given did not produce any change in the liver function tests such as GOT, GPT, ALP, Bilirubin, total protein and Albumin/Globulin ratio. • Chronic administration of the Phase 2� did not produce any change in the renal function as indicated from serum urea, creatinine and electrolyte levels. • Chronic administration of Phase 2� did not produce any change in the haematological parameters such as total WBC, differential count and platelets. • There was no change in necroscopy of the animals and organ weight of the animals such as liver, kidney, spleen were unchanged. • Histopathology of liver and kidney of the Phase 2� -treated groups was normal and similar to controls.